Phyllo pastry is readily available and has the advantage that it adds contrasting crispness to fillings, yet is much lower in kilojoules than other pastries. Turkey or luxury fish turn this into festive fare. A superb light meal or second meat course. Two filling options, both equally tasty and suitable, are included. Serve with crisp salad or colourful steamed vegetables. During the festive season this pie can fill many gaps on the menu. The fillings given below may be adjusted by using leftover turkey or ham instead of the chicken and luxury fish such as pink salmon or even crayfish to replace the white fish. Place 2 sheets of pastry on a chopping board, allow to stand about 10 minutes to become dry and brittle. When dry, crumble the pastry into fine flakes, sprinkle with 15 ml of the melted butter and toss with fingertips to coat evenly. Prepare the selected filling as explained below and set aside. Preheat oven to 180°C. Brush 22 cm pie dish with melted butter. Brush and layer the remaining six sheets of pastry in a star pattern, with points protruding over the straight edges. Place into the dish and press into the corners. Spoon the filling into the pastry lined dish and fold each layer of the phyllo pastry, bit by bit towards the centre to cover the filling. Press down gently. Sprinkle the flaked phyllo evenly over the top and bake about 30 minutes or until the flakes are golden, filling set and the pie appears slightly risen in the centre. Place the white fish, butter and lemon juice in a saucepan and cook, stirring until the fish is firm and no longer translucent. Stir in the flour and milk and cook, stirring until thickened. Stir in the cheese, spring onion, dill or mixed herbs and additional seafood. Set aside to cool. Place the butter into a saucepan and sauté the mushrooms, garlic and onion for about 5 minutes or until tender and most of the liquid has evaporated. Stir in the herbs and flour and add the milk and cream. Bring to boil while stirring and cook until a smooth thick sauce is obtained. Set aside to cool. 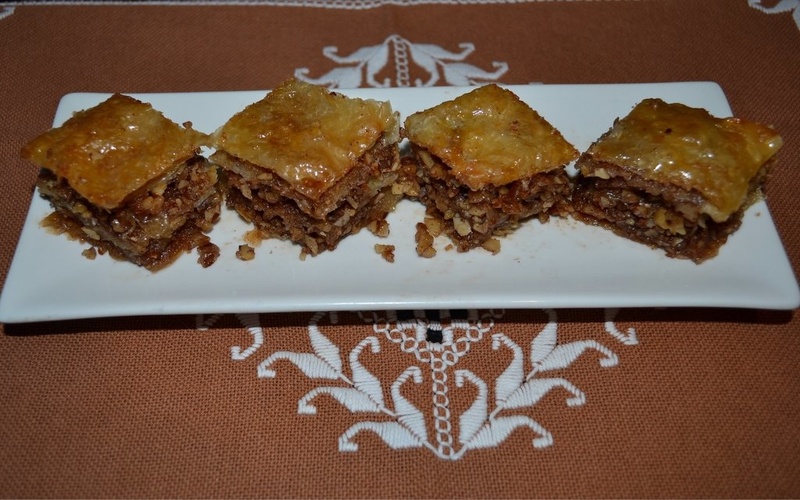 Kataifi (ka-ta-e-fee), also known as shredded wheat dessert, Kataifi, along with the more well known Baklava, is one of the most popular and delicious Greek Desserts. It is made with a special type of pastry called kataifi or kadaifi. The pastry is like angel hair pasta and when rolled up resembles shredded wheat. A delectable nutty centre is rolled inside crisp, thread like strands of pastry, baked, then soaked in a sweet syrup. Like many Greek dessert recipes a sweet syrup is poured over the cooked sweets, which keep them from drying out and preserves them. Some traditional Greek recipes use only almonds, but a mixture of walnuts, pistachios and almonds – even pecan nuts and pine nuts could also be used. Kataifi should be treated in the same way as phyllo pastry with regards to thawing and storing. Pre-heat the oven to 170 ℃ and line a baking sheet with a Wizbake baking sheet. In a food processor, pulse your nut mixture until you’ve achieved a crumbly nut mixture. Empty into a bowl and mix in the remaining ingredients of the filling. Unroll the Kataifi pastry and work the pastry with your hands, tearing apart the shreds and gently spreading it out a bit. Cover the Kataifi pastry with a damp towel. 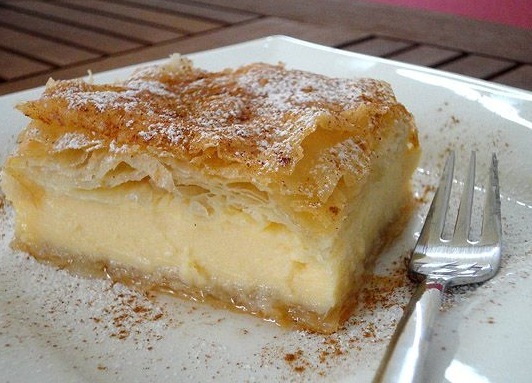 Work with one piece of pastry at a time and drizzle the surface of the Kataifi with melted butter. Spoon 15 ml of the nut mixture at one end of the Kataifi strip. Roll the strip up tightly into a small cylinder. Do the same with the rest of the pastry and filling. 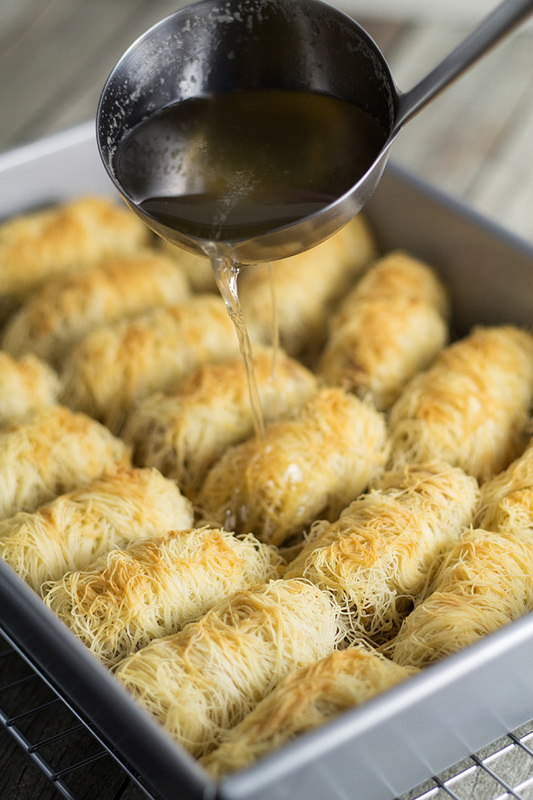 Pack the the assembled Kataifi rolls tighlty on the baking sheet and drizzle with some more of the melted butter. Bake for 1 hour. Allow to cool. To make the syrup, combine all the syrup ingredients in a saucepan and it bring to a boil, then simmer over medium heat for 15 minutes. Keep the syrup hot until your Kataifi has cooled from the oven. The Kataifi must be cool and the syrup hot! Using a ladle, pour 3/4 of the hot syrup over the kataifi. Set the Kataifi aside for 10 minutes. Ladle the rest of the syrup over the kataifi and allow to cool before serving. These cigars will be popular with young and old! The recipe can easily be doubled to ensure that there is enough. To make the filling, melt the butter or margarine and chocolate in a heatproof bowl over simmering water. Remove from the heat and stir in the rest if the ingredients to make a thick paste. Leave to cool. To make phyllo rolls, cut the phyllo into 15 x 15 cm squares and place the phyllo squares under a clean, dry kitchen towel to prevent them from drying out. Lay out 2 squares of phyllo pastry on the work surface at an angle. Use a pastry brush and lightly brush one of the squares with the melted butter and cover with the second square. Place 30 – 50 ml of the filling on the bottom corner of the sheet and enclose it with the corner of the sheet. Fold in the sides and roll the pastry up like a cigar. Do not roll it up to tightly as some fillings expand during baking. Continue until all the filling has been used. Brush each pastry with a little of the melted butter or margarine and transfer to a greased baking tray. Bake the pastries for 15 – 20 minutes or until light golden brown. Transfer the pastries to a serving dish and serve hot or at room temperature. Apart from the typical sheets, one also gets phyllo pastry which has been shredded to resemble vermicelli and which is called Kataifi. Kataifi is not readily available, but may be found in specialised shops or bought from Greek confectioners. Be sure to also try the recipe for authentic Kataifi. Place the kataifi, nuts, sugar and cinnamon in a mixing bowl and toss with a fork to combine. Add the melted butter and toss well until evenly moistened. Work in the butter with the fingertips if necessary. Fold the sheets of phyllo pastry in half, unfold and cut through the fold line. Stack the wide strips and cover with a cloth. Brush each strip with melted butter and sprinkle evenly with a thick layer of filling. Roll each strip of pastry into a cylinder, allowing the filling to extend a little at the sides and place the rolls side by side on a baking tray lined with a Wizbake baking sheet. Bake at 180 ℃ for 15 minutes or until light golden brown. In the meantime, combine the ingredients for the syrup and bring to the boil. Pour the warm syrup over the baked rolls and allow to cool. Leave the rolls to stand for at least an hour until all the syrup has been absorbed and served cold. Recipe by Carolié de Koster for the Art Of Cooking Recipe Book p. 798. 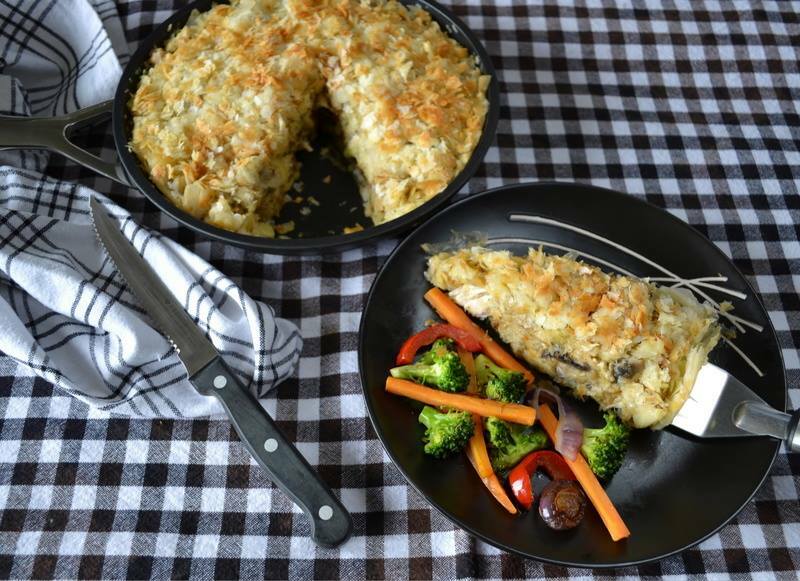 The creamy seafood filling in a crispy crust makes a wonderful pie which is equally good as a main course with vegetables or salad or in smaller portions as an elegant first course, garnished with a spoonful of tomato-flavoured cream and a sprig of dill or parsley. Saute the onion in butter until tender and transparent, but not browned. Add the mushrooms and saute, stirring from time to time until most of the liquid has evaporated. Stir in the flour and add the milk, stock powder and dried thyme and herbs. Bring to the boil, stirring until a thick, smooth sauce has formed. Beat together the eggs and cream and stir onto the sauce. Add the mussels, shrimps or prawns and parsley and stir to combine. Add the salt and pepper and adjust seasoning as necessary. Brush the base and sides of a rectangular ovenproof dish (about 300 x 200 x 60 mm) with melted butter and line with 5 sheets of phyllo pastry, brushing in between and folding it to fit the dish without cutting away any of the pastry. Pour the filling into the crust and cover with the remaining sheets of phyllo pastry, brushing in between and folding the sheets to fit. Fold the last sheet neatly to create a smooth top surface and brush with the remaining butter. Bake at 180 degrees for 35 minutes or until the crust is crisp, the filling has set and the pie appears slightly risen in the centre. Switch off the oven, open the door slightly and allow the pie to stand in the oven for 10 minutes before serving. In the meantime, beat the cream until stiff and beat in the tomato sauce and Tabasco sauce. Cut the pie into 6 to 12 squares and serve warm with a spoonful of flavoured cream and a sprig of parsley or dill. 6 servings as a main meal or 12 as a first course. Select seafood according to preference and availability. Any canned or cooked fish or combinations of the two can be used to replace the mussels and prawns. Tuna, salmon or marinara mix will make a good pie. Recipe by Carolié de Koster from the Art Of Cooking recipe book p. 777. Most decorative to serve for any special breakfast, as a health breakfast or even a dessert. 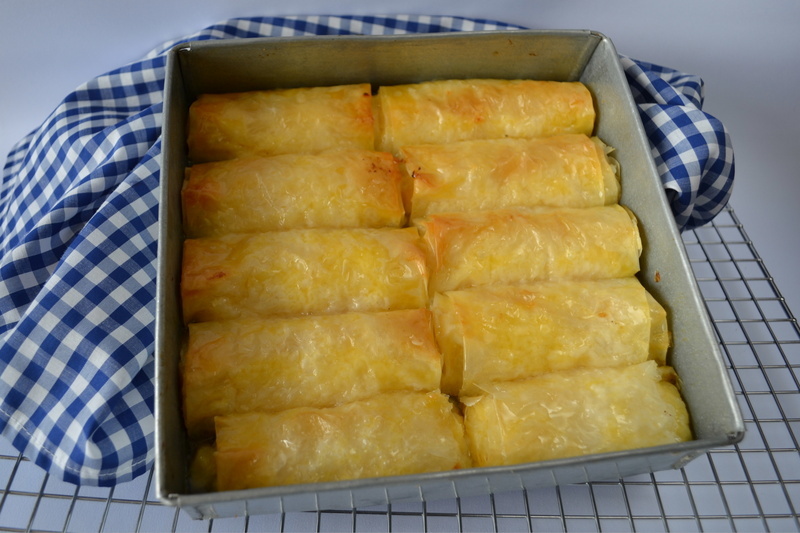 The phyllo squares may be made days in advance and stored in airtight containers. Select fresh fruit or make combinations with fresh and canned fruit, e.g. strawberries, mixed berries kiwis, mangoes, litchis, pineapple, melon, spanspek, guavas, kiwi fruit, gooseberries, paw-paw or banana – as preferred or available. Wash, peel and cut into neat portions. The kind of yoghurt used depends on taste and the sweetness of the fruit used. Fold the sheets of phyllo pastry simultaneously in half, unfold and cut through the fold line. Place the 8 wide strips on top of each other, fold in half again and cut in the same way to obtain 16 strips. Stack the strips.Fold the strips simultaneously in half lengthways, unfold and cut in half on the fold line. Pile the shorter strips on top of each other and fold and cut once more to obtain 64 squares. Stack the squares and cover with a cloth or seal in an airtight container. Line a large baking tray with a . Place as many of the squares as will fit comfortably, onto the baking tray. Brush lightly with melted butter, cover each square with a second square and brush again. Make double-layered squares or if preferred multi-layered squares and separate into double layers after baking. Bake at 180°C for 4 to 5 minutes or until the squares are pale golden and crisp. Take care not to over bake – if baked until brown the taste and appearance will be impaired. Cool, pack carefully into airtight containers and store until required or up to a month. 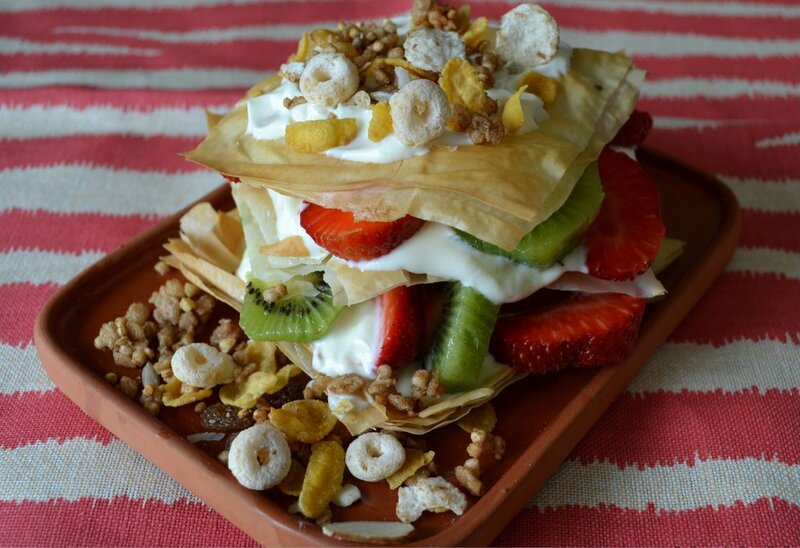 To assemble the stacks, place one double-layered square of phyllo pastry onto a serving plate, add a spoonful of yoghurt and arrange some fruit on top. Cover the fruit with a second double-layered phyllo square and repeat, ending with a third double layered phyllo square. Dust with icing sugar and finish with fruit and nuts or muesli. Four sheets of phyllo pastry will make 32 double layered squares sufficient for at least 10 stacks. Recipe by Carolié de Koster from the Art Of Cooking recipe book – p. 795. Asparagus is starting to come into season now. 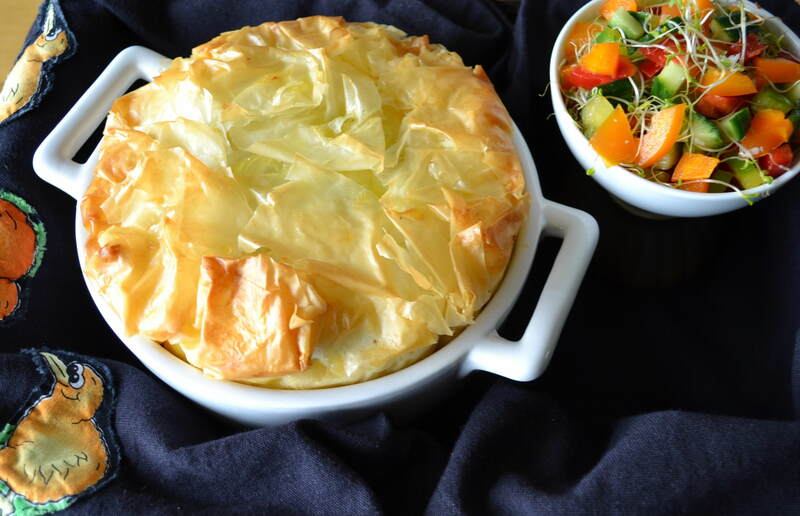 Surrounded by light and crisp Parmesan flavoured phyllo pastry makes it superb! Prepare this do-ahead snack but bake shortly before serving, as is or as as part of a meal, accompanied by the lemon dip. Line a baking tray with a Wizbake baking sheet or baking paper and preheat the oven to 180 º C.
Rinse asparagus and cut away or snap off the tough ends. Brush with melted butter or butter and oil. Place 1 sheet of phyllo pastry onto the work surface with the longer side facing towards you. Brush with melted butter or butter and oil. Place 1 sheet of phyllo pastry onto the work surface with the longer side facing towards you. Brush again and sprinkle with cheese and seasoning. Fold in half, or if asparagus spears are quite short, into thirds – the tips need to protrude (see photo). Place 2 asparagus spears onto the side of the pastry, in such a way that the tips extend over the pastry to remain exposed. Fold up the edges to cover the ends of the asparagus with pastry and roll up. Place seam side down on the baking tray. When all the rolls are on the tray, brush again and sprinkle with more cheese and seasoning. Bake 15 to 18 minutes, or until golden and crispy. Combine the mayonnaise, yoghurt, lemon juice and garlic and spoon into a small bowl to serve as a dip with the asparagus. 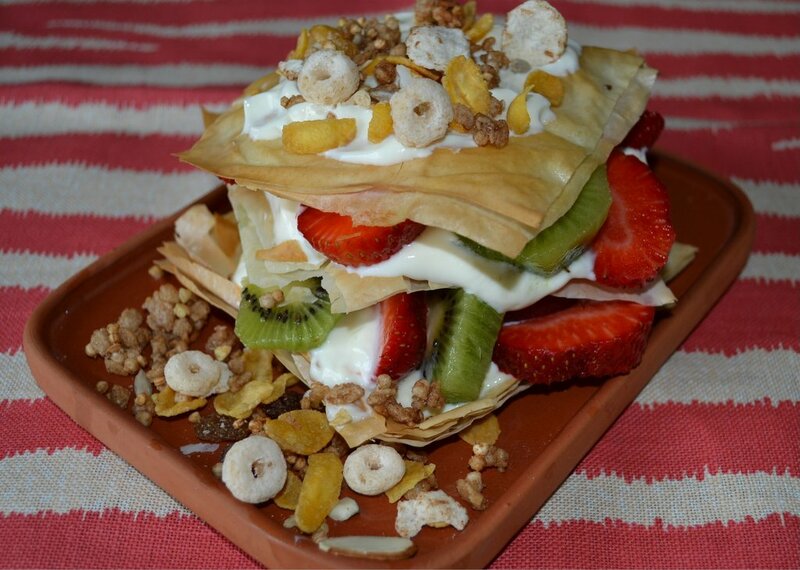 A true gourmet dessert which combines the elegance and sophistication of phyllo pastry with the goodness of fresh fruit. The filled phyllo pastry rolls may be fitted into a round cake tin to form a most decorative twist or placed onto baking trays to make 2 small or one large strudel. Place the sheets of phyllo pastry onto a cloth and cover with another dry and then a damp cloth. Place the butter into a small saucepan or suitable jug and melt on top of the stove or in the microwave on MEDIUM for 1 – 2 minutes. Combine the chocolate, nuts, breadcrumbs, sugar and cinnamon in a small bowl. Peel and core the pears and slice thinly into a bowl. Add the sour cream , sugar and cinnamon and toss together. Lay out two sheets of phyllo pastry next to each other, brush with melted butter and sprinkle with 1/2 of the chocolate and nut mixture. Repeat once more, cover with the last sheets and brush with butter or margarine only. Note: If a large strudel is made, place the two stacks on top of each other at this stage. Spread the pear filling onto the layered phyllo pastry, leaving 50 mm at the edges uncovered. Fold the sides over the filling and roll up neatly. To make the twist, bend the 2 small rolls and place into a 220 mm spring-form cake tin, brushed with melted margarine, with the ends of the rolls fitting in between each other. To make the strudels, place onto a baking tray lined with a Wizbake baking sheet and brush the tops op the strudels generously as well. Bake at 180°C for ± 35 minutes for the twist or small strudels and 45 minutes for the large strudel or until golden and crisp. If the pastry browns too soon, cover loosely with foil as soon as the desired colour is reached and continue baking for the rest of the specified time to ensure that the filling and inner layers of pastry will be thoroughly cooked. To make the sauce, if fresh or frozen berries are used, place the berries and sugar into a saucepan and cook over moderate heat while stirring until the sugar dissolves and the berries soften. Leave whole or strain through a coarse sieve and discard the seeds. Return the puree if made to the saucepan or place the canned fruit and sauce into the saucepan and stir in the cornflour mixed with the 30 ml water. Bring to boil while stirring until the sauce becomes thickened and translucent. Cool, stir in the liqueur and serve warm or refrigerate. Remove the twist or the strudels from the tins carefully and dust generously with icing sugar. Cut the twist into sections to serve – not into slices as for a cake. 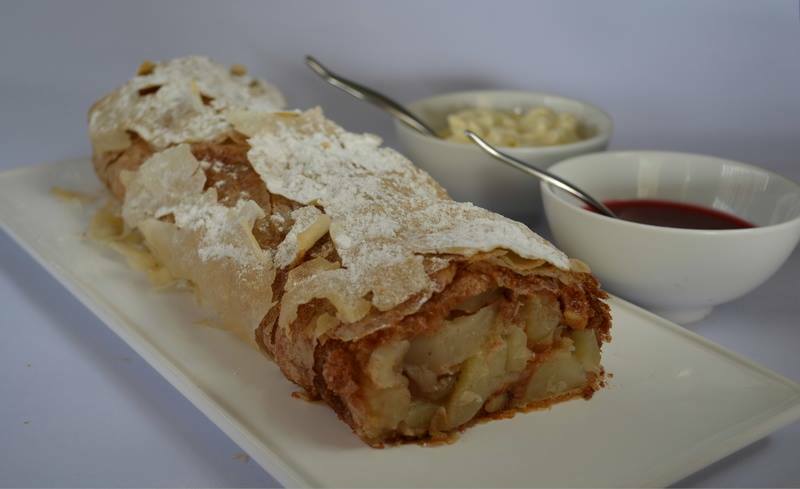 Cut the small strudels into 40 – 50 mm sections or slice the large strudel into 20 mm thick slices. An electric knife simplifies the task. To serve, pour about 30 ml of the fruit sauce onto each individual serving plate and place 1 – 2 neat portions or slices onto the plate. Decorate with a sprig of mint and a tiny flower and pass a bowl of whipped cream for those who want to go all the way! Recipe by Carolié de Koster from Art Of Cooking p. 793. Phyllo pastry lends itself to be rolled around a savoury or sweet filling and shaped into decorative crackers. Strips of blanched spring onion or chives will make neat bows for baked savoury crackers. The crackers can also be made with a sweet filling, e.g. Apple & Cranberry (picture below). To make the filling, heat the butter or margarine and add all the remaining ingredients. Stir – fry 5 minutes over high heat until the moisture has evaporated. Cool and drain well. For a more substantial cracker, brush a sheet of pastry with melted butter or margarine, fold in half and brush again. For a lighter cracker, cut the sheets of pastry in half and brush with melted butter or margarine. Divide the filling between the sections, placing it at the base of the sheet. Roll up loosely, pressing the pastry with the fingertips to form a cracker shape while rolling. Press firmly into shape to make neat crackers. Place the crackers onto a greased baking tray and brush with melted butter or margarine. Bake at 180 ºC for 8 – 10 minutes or until golden and crisp. Blanch the chives or strips of spring onion by covering with boiling water for a few minutes until softened. Drain, rinse in cold water and dry. Tie the chives or strips of spring onion around the indentations at both ends of each cracker. For delicate crackers, use a single layer of pastry for each cracker (3 sheets) or for more substantial crackers, use a folded sheet of pastry or double layer of pastry for each (6 sheets). Recipe by Carolié de Koster from Art Of Cooking. There is a whole chapter on Phyllo pastry which includes hints for shaping and baking phyllo pastry, a variety of sweet and savoury recipes, etc. (page 761 to 800). 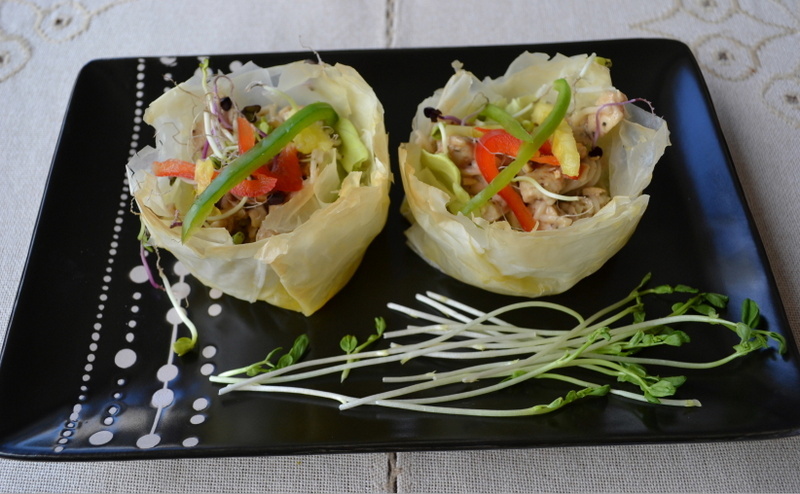 Crispy phyllo baskets are filled with Thai-spiced chicken, tossed in a peanut dressing and mixed with noodles. Prepare ingredients several hours before but fry and assemble close to serving time. The salad baskets are garnished with crisp and colourful salad ingredients to compliment the filling. Combine the ingredients for the spice mixture and set aside. Combine the ingredients for the dressing in a suitable container, seal and shake well to combine evenly. Bring the water, salt and oil to the boil and add the noodles. Bring to boil, reduce heat and simmer until tender. Drain in a colander and toss in a little oil to separate noodles. Flatten the chicken breast fillets with a mallet to 1 cm thick and sprinkle the seasoning over the breasts. Set aside to cool. Then cover and refrigerate until ready to fry and serve in the salad. Heat the oil and fry the breasts gently until tender and cooked through. Cool slightly and slice diagonally into thin strips. Toss the noodles with enough of the dressing to moisten it well and toss in the chicken strips as well. Set it aside. Line the filo baskets with a little lettuce and divide the chicken and noodle mixture between the baskets. Scatter half of the greenery over the chicken and drizzle with a little extra dressing. Sprinkle the additional garnish over all, then lastly the rest of the greenery and nuts and dressing and serve at room temperature, preferably before refrigerating for best texture and flavour. Sufficient salad for 12 jumbo muffin tin sized phyllo pastry baskets. Brush the jumbo muffin cups well with melted butter. Pre-heat the oven to 180°C. Fold the 6 sheets of filo pastry into thirds, unfold and cut through the sheets on the fold line to make 18 strips. Stack the strips and fold into thirds again. Unfold and cut on the fold lines again – you will now have 54 squares. Brush the first square with melted butter and cover with a second square, the points protruding star-shaped over the straight edges of the first. Repeat twice more to have a star shaped, 4 layered stack and press down neatly into the muffin tins. Repeat until all have been made. Bake about 5 minutes or until very pale golden. Take care while baking and check constantly for the pastry cases brown quickly and if over baked taste and appearance will be impaired. The pastry cases may be stored up to a month in an airtight container. Serve the salad on a lettuce line salad platter instead of a basket and garnish as above. Serve the hot chicken on pasta or rice with vegetable accompaniments as above. Replace the chicken with fish, pork or beef fillet. Recipe by Carolié de Koster. There is a whole chapter on Phyllo pastry in the Art Of Cooking recipe book which includes hints for shaping and baking phyllo pastry, a variety of sweet and savoury recipes, etc. (page 761 to 800). An all in one breakfast and most versatile, more than classic New Zealand favourite! This pie can be made in different shapes and sizes and enjoyed for breakfast fresh from the oven! It is made and enjoyed at home and served in coffee shops but can also be eaten cold for picnics or added to lunchboxes as a treat. Pre-heat the oven to 180 ºC and brush the 12 cups of a muffin tin with melted butter or margarine. Fold the 4 sheets of phyllo pastry into thirds and cut on the fold lines. Stack the strips and fold into thirds again. Cut to make 36 squares. Brush 12 of the phyllo squares with melted butter or margarine and cover with 12 squares, points crossing the straight lines. Brush again and place neatly into the muffin tins to make pastry cases. Fry the bacon for a few minutes to release a little bit of fat and add the onion. Cook and stir until the onion has softened. Spoon the bacon and onion into the pastry cases and break an egg into each. Beat together the cream or evaporated milk, hot milk, 4 additional eggs, salt and pepper and stir in the spring onion. Divide the mixture over the eggs and sprinkle with cheese. 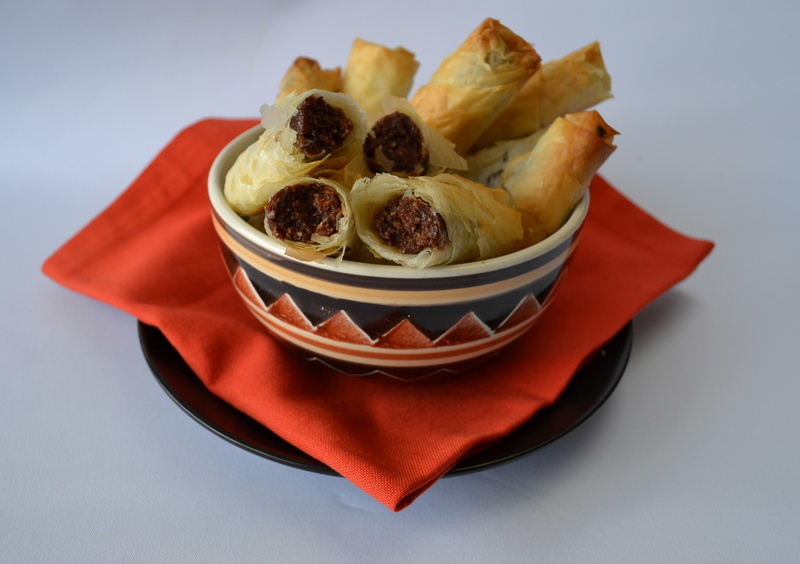 Place the last sheets of pastry over the tops, brush lightly with melted butter or margarine and carefully fold over the points of all the layers of phyllo pastry to cover the filling. Press down lightly and brush with melted butter or margarine. Bake the pies 15 – 20 minutes or until the pastry is golden and the filling and eggs have set. Cover the pies with foil if the pastry browns too soon or too much before the filling has set. Serve warm or cold as explained above. The basic savoury minced beef recipe has many delicious uses, from patties for home-made hamburgers, to meatballs or meat loaf. Place all the ingredients in a large mixing bowl and mix well to combine. Shape the mince mixture into 6 to 12 patties with floured hands. Brush the patties with oil and grill about 5 minutes on a side for medium-rare or 7 to 8 minutes for medium-done. Do not cook the meat too dry. Pre-heat the oven to 180 °C. Form the mixture into balls the size of a golf ball. Melt the butter in a suitable ovenproof dish and place the meatballs in the dish. Roast for about 30 minutes until well-browned and cooked. Turn the meatballs after 15 minutes. Serve the meatballs with pasta and Barbeque sauce or with condiments like tomato sauce, mustard, mayonnaise, etc. Fold the 2 sheets of phyllo pastry simultaneously in half, unfold and cut through the fold line. Place the 8 wide strips on top of each other, fold in half again and cut in the same way to obtain 16 strips. Stack the strips. Fold the strips simultaneously in half lengthways, unfold and cut in half on the fold line. Pile the shorter strips on top of each other and fold and cut once more to obtain 64 squares. Stack the squares and cover with a cloth or seal in an airtight container. Place as many of the squares as will fit comfortably, onto the baking tray. Brush lightly with melted butter, cover each square with a second square and brush again. Continue until all the squares are used – stacking up to 4 on top of each other. Bake at for 4 t0 5 minutes or until pale golden. Cool and set aside or pack carefully and store in an airtight container until required or up to a month. 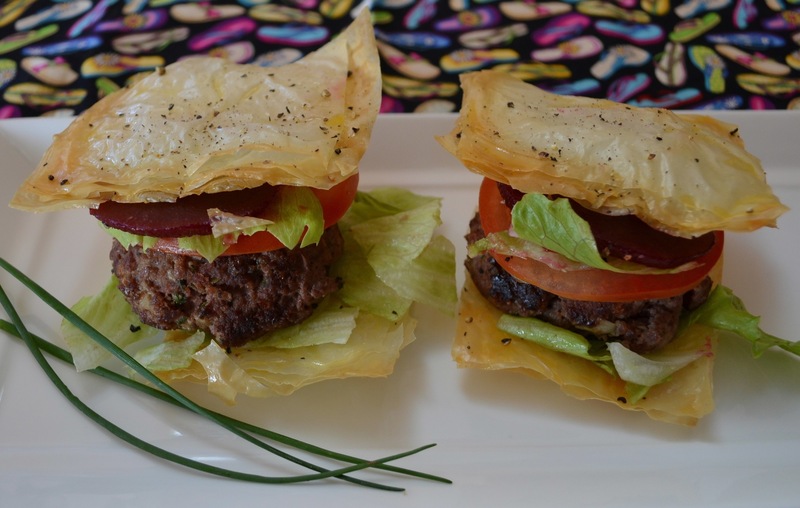 To assemble the hamburgers, place one multi-layered baked phyllo square onto a serving plate and top with lettuce. Place a hamburger patty on the lettuce and drizzle a little salad dressing over it. Top it with a slice of tomato and some more lettuce. Finish of with a second multi-layered baked phyllo square. Do the same with the rest of the ingredients and serve immediately. Nut-filled layers of filo pastry, flavoured with spices and drenched with a fragrant syrup is one of the most irresistible sweet treats. This adapted recipe is not overly sweet or spicy. Make baklava at least two hours or up to a day before serving to allow the syrup to work it’s way through all the layers. Combine the selected nuts to make up 300g and place into the bowl of a food processor. Use the “pulse action” and chop the nuts very briefly until coarsely and evenly chopped but not too fine. Stop once or twice in between and stir to allow the larger pieces to move closer to the blade. Add the sugar and spices and mix. Brush the base and sides of a rectangular dish or baking tray (± 30 x 20 x 6cm) with melted butter and pre-heat the oven to 170°C (see notes below) . Divide the pastry sheets into four and the nut mixture into three. Line the dish with the first ¼ of filo pastry, brushing lightly in between all sheets with the melted butter. Fold the pastry in at the sides if necessary but do not cut away and discard any pastry. Brush the top of the last layer with melted butter. Sprinkle 1/3 of the nut mixture over the pastry and repeat until four layers of pastry with three layers of nuts in between have been made, ending with pastry. Brush the rest of the butter over the top. Mark the pastry into diamonds or squares (2 ½ – 3 cm side length) with a sharp knife, cutting through the top layers only to prevent the syrup from accumulating in the dish under the last layer. Bake about 30 minutes, or until golden brown. To make the syrup, place the sugar, water, cinnamon stick, cloves and lemon juice in a small saucepan and stir over a moderate heat until the sugar has melted. Simmer gently for 10 minutes to become syrupy. Remove from heat, stir in the honey and flavouring and allow to cool while the pastry is still baking. Remove the pastry from the oven and pour the cooled syrup slowly and evenly over the hot pastry. Allow to cool completely (at least 3 hours) to absorb all the syrup before cutting through the marked lines into diamonds or squares. Store in airtight containers in the refrigerator. Baklava may be frozen to extend the period of enjoyment! Serves 24 – 30 portions, depending on size. Combine at least three kinds of nuts or even more for the best flavour. You can include Walnuts, Sliced Almonds, Pistachios, Pecans, Macadamias, Brazil Nuts or Cashew Pieces. Selecting a dish or baking tray in such a way that one side of the dish corresponds with the width of the filo pastry will make the layering process a pleasure and the end result as neat as can be. Recipe by Carolié de Koster for the Art Of Cooking Recipe Book p. 787. 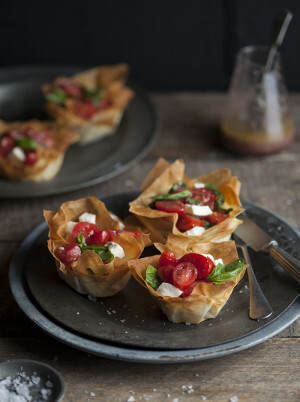 Fill these light and crisp pastry cases with a mixture of small chunks of Mozzarella cheese (± 200 g) mixed with the same quantity of halved baby tomatoes, torn or shredded fresh basil leaves, a drizzle of favourite salad dressing and a dash of salt and ground black pepper. Note: The pastry cases may be made well in advance and stored in an airtight container until required. Fill with the mixed Caprese style salad filling shortly before serving. Fold the 3 sheets of phyllo pastry in half and press down onto the fold line. Unfold and cut through the sheets on the fold line. Fold the halved sheets in half again and cut the same way as before to make 12 strips. Stack the strips and fold in half again lengthwise. Unfold, cut on the fold line once more to make 24 shorter strips and stack again. Cut in half lengthwise once more to make 48 squares. Preheat the oven to 170°C and brush 16 medium muffin cups lightly with butter. Brush the first phyllo pastry square very lightly with melted butter and cover with a second square with the points protruding star-shaped over the straight edges of the first. Repeat with the third square and place the stack over the cup of the muffin tin. With the finger tips, press down gently into the cup to shape neatly and repeat until 16 pastry cases have been made. Bake for about 5 minutes or until pale golden. Take care while baking and check constantly for the pastry cases brown very quickly and if over baked the taste and appearance will be impaired. Makes 16 x 3 layered pastry cases. Recipe by Carolié de Koster. See page 767 of the Art Of Cooking recipe book or instructions on how to make smooth-edged pastry cases. The components for this dessert are “fused” into breathtaking fantasies! Make it a day or two in advance and assemble shortly before serving. Fold 4 sheets of phyllo pastry simultaneously in half lengthwise, press down lightly, unfold, cut through fold line with a sharp knife and stack the 8 wide strips. Fold in half and cut in the same way to obtain 16 strips. Stack all the strips. Fold the strips simultaneously in half lengthwise, unfold, press down lightly and cut in half on the fold line. Stack the shorter strips and fold and cut once more in the same way to obtain 64 squares. Stack the squares, cover with a cloth or seal airtight and refrigerate if not baked soon after cutting. Bake at 180ºC for 4 – 5 minutes or until pale golden (biscuit colour). Watch carefully to make sure that the squares do not brown too much for it will spoil the taste and appearance. Cool and set aside to use or pack carefully in an airtight container until required. To make the poached meringue and custard filling, pour the milk into a large shallow saucepan and heat gently to just below boiling point. Beat egg white and cream of tartar until firm and gradually beat in sugar to obtain a stiff meringue. Dip an oval shaped tablespoon into the hot milk, scoop out neat rounded spoonfuls of the meringue and place into the hot milk. Take care that the milk does not come to boil at any stage for the meringues will separate and curdle into the milk. Poach the meringues about 2 minutes on a side or until each floating meringue sets and expands in the hot milk. Turn over and poach gently for 2 minutes more. Lift out the poached meringues with a perforated spoon and place into a colander to drain. If the poached meringues are not used within a short time, place in an airtight container and refrigerate for a day or two. Return the drained milk to the saucepan with the milk to make the custard. Beat together the egg yolks, whole eggs, sugar, cornflour, salt, 1/3 cup (75 ml) milk and flavouring and add a little of the hot milk to the mixture. Return to the saucepan and bring to boil, stirring constantly. Turn down the heat and cook 2 – 3 minutes more or until thick and bubbly. Pour into a bowl, cover with a cloth and cool until required or refrigerate for a day or two until ready to assemble. Prepare the caramel and nut syrup. Place the oil and nuts into a saucepan and heat to moderately hot, stirring continually until the nuts turn pale golden. Add the sugar and cook about 3 minutes, stirring until the sugar starts to melt and caramelise. Remove from heat as soon as the caramel is golden brown and add the water. Stir until the sugar has dissolved and add the honey or syrup and flavouring. Bring to boil, simmer 2-3 minutes to become syrupy and set aside until ready to use or seal and store for a day or two. When ready to serve, place one triple layeredphyllo square onto each individual plate or place 10 of the baked squares onto a large serving platter. Divide the custard between the squares and spoon the poached meringue on top. 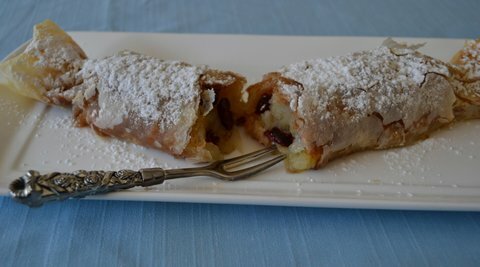 Cover the filling with another baked double layer of fried phyllo and place a spoonful of cream on top. Drizzle caramel and nut syrup decoratively over each assembled fantasy! Recipe by Carolié de Koster from the Art of Cooking Recipe book p. 795.